Sawatdee Kaa! Welcome to the Eco Pages of Thailand! Explore the Thai islands, many of which offer lush jungles, pristine beaches and clandestine caves filled with wildlife, birds and plants. There are also plenty of healthy vegetarian and organic options, making snacking a national pastime and a must-do for visitors. Browse through some of our favorites in the Restaurants category. Your home is the best place to start greening your lifestyle. If you live in Thailand, you’re in luck! Bountiful natural resources allow for many designers to think locally when creating home furniture and design products. Decorate your home with sustainable materials in the latest styles, and see how materials like bamboo are transforming furniture and home design. Search for bamboo shops and suppliers and much more in the Furniture & Houseware category. 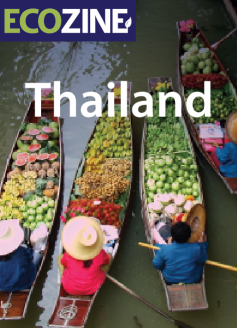 Experience sustainable Thailand!